The MR160, launched by FLIR Systems, is the first moisture meter to be equipped with a built-in thermal camera and features Infrared Guided Measurement (IGM) technology driven by a FLIR Lepton® thermal camera core. 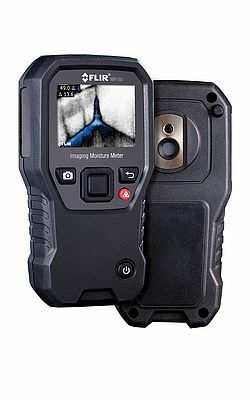 With the addition of this capability, FLIR has developed the only moisture meter with the ability to instantly and efficiently pinpoint potential moisture issues which are represented visually in the thermal image. The user then knows where to place the MR160 probes on the surface of the wall, ceiling, or floor to best quantify moisture levels and problems. "The MR160 expands our FLIR-branded Test and Measurement product line and represents the eighth product FLIR has introduced that is based on our revolutionary Lepton thermal camera core," said Andy Teich, President and CEO of FLIR. "The MR160 also demonstrates how we are able to create new product categories that make products significantly more useful by integrating unique FLIR sensor technologies." MR160's portable, durable design and internal rechargeable battery make it an effective tool for every industry professional to carry on their tool belt. Along with thermal imaging, the MR160 includes an internal pinless probe for non-destructive quantitative measurements as well as an external pin probe for contact readings that help confirm actual moisture levels. A built-in laser pointer and display cross-hairs make targeting easy. Users can capture and save both measurements and images together, and easily transfer the data to a PC for analysis and report generation using FLIR Tools software.